In 1993 the Brainbusters and Tidewater Model Soaring Society clubs started the Swap Meet and it has continued the past 26 years. 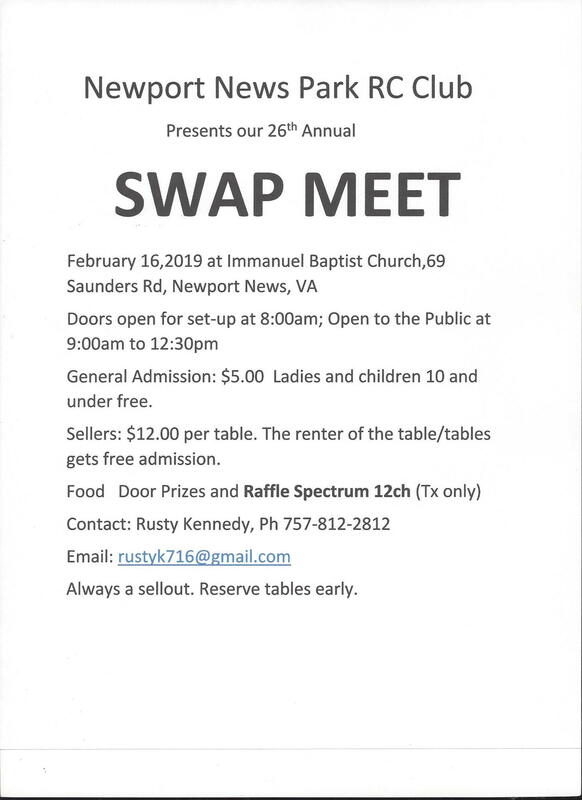 Newport News Park Radio Control Club, Inc has proudly continued and presents the 26st annual SWAP MEET. General Admission: $5.00 (Ladies free, Children 10 years old and younger are free). Sellers: All tables are $12.00 each. Only the renter of the table or tables gets free admission. Reserve tables early as 2018 was a complete sell out. We were down to renting floor space. Plenty of food. Come hungry. All food and drink provided by Church Youth Group. 2019 RAFFLE: ix12 12-Channel DSMX Transmitter Only, You DO NOT have to be present to win.